What does topstitch mean in sewing and how do you do it? Find out everything you need to know about topstitching here! If you look around the room you're in or the clothes you are wearing, there is a good chance you will see some topstitching on fabrics. But what is topstitching? Topstitching is a sewing stitch that is visible. It is meant to be noticeable and adds a decorative touch to your sewing pattern. Topstitching can be used for nearly any sort of fabric piece, from wearables to toys to home decor and everything in between. It is sometimes also referred to as edge stitching since its often used at the edges of the item. Most commonly, you will recognize topstitching in jeans. Topstitching is used on most denim to create decorative edging. You will also see that the topstitching is created with a different color thread than the jeans, such as white or gold. Topstitching is a wonderful way to finish off your project and makes it look clean and professional. You can learn to topstitch using a machine or how to do your topstitching by hand, both which will lead to beautiful results for the final sewing pattern. Besides going over the question, what is a topstitch?, we will offer two tutorials, one for using a sewing machine and one for hand sewing, as well as go over the some of the types of topstitching. Using a sewing machine is the easiest way to assure that you are creating a clean, even, and straight stitch. This is important because the stitch is visible. If you are using a decorative stitch for your topstitching, you can use a regular foot. However, if you are doing the more common straight stitch, you will want to use the edging foot. The simple tutorial below is for the straight stitch but you can use this as the basis for any other stitch as well. Watch the video here or follow along below for the written instructions and images. Decide where you are going to begin your stitch. This should be on the back or in a place that is the least visible. Note: Use clips on your fabric for the stitching so that it stays in place while sewing. You will remove the clips as you sew. Attach the edgestitch foot to your machine if you are using a straight stitch. Change the needle position so that it is off-center. This will help you follow and view the stitch as you go. On your machine, do a locking stitch. This is about three stitches in, three stitches up from the start point. Start sewing your topstitch. Go slowly and remove your marking clips as you go. Continue until you have completed the stitch. For a more handmade look or for when you want to add topstitching with some interesting detail that cannot be created on a machine, sewing by hand is a great option. It does take more skill and patience to sew by hand so be prepared to work harder than if you were using a machine. On the plus side, hand sewing is fun and relaxing and allows you to move at your own pace and stitch as you please. The tutorial below is for the straight stitch (or backstitch). To learn the basics of sewing straight, be sure to check out our page on How to Sew a Straight Line by Hand. Watch the video here or follow along with the written tutorial below. 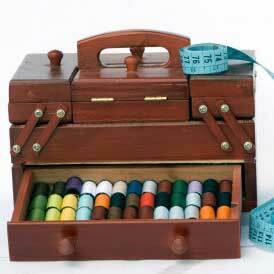 Decide where you want to start stitching. This should be on the back of the piece or in a place that is the least visible. Note: Add clips to the edges of your piece if desired to help keep everything in place while sewing. Start from the back and move up through the top of the fabric, a stitch length from the beginning. Tip: Make sure you are including all parts of the fabric you want to secure with the stitch. Note: The image shown below has one sample row of stitches complete. Look at the second row. Move backward to the where the stitch should begin and then push the needle and thread back down through the fabric. Pull your thread all the way through. This is your first visible stitch, as you can see in the second row of the image below. Push the needle and thread back up through the back, one stitch length on the right of the complete stitch. Push the needle and thread through the second hole of the first stitch. This creates the appearance a more seamless line. Repeat the process until your topstitching is complete. Tie off your last stitch. What does a topstitch look like? The most common topstitch is the straight stitch or backstitch. It allows for a clean, straight line that works for most projects. Yet, that is not the only option. Some of the other popular stitches you can use for topstitching include the running stitch, zigzag, serpentine, stem stitch, cable, rosette, chevron, and fern. Sewing topstitches is always a fun addition. Before choosing a decorative topstitch, you have to consider what stitches are available on your machine if using or your sewing abilities if you are topstitching by hand. Below, you see a variety including a running stitch, zig zag, serpentine, and rosette. Below is the stem stitch. Click here for our stem stitch video tutorial. Jeans tend to use straight, running stitches. Below is an example. This apron also shows a thin running stitch inside of the hemline. Even straight stitches can be decorative when you add multiple lines of stitches. This fleece piece below shows three lines of straight stitching. The only topstitching I've ever done is when I hem my jeans but I like the idea of adding more decorative stitches on other projects.